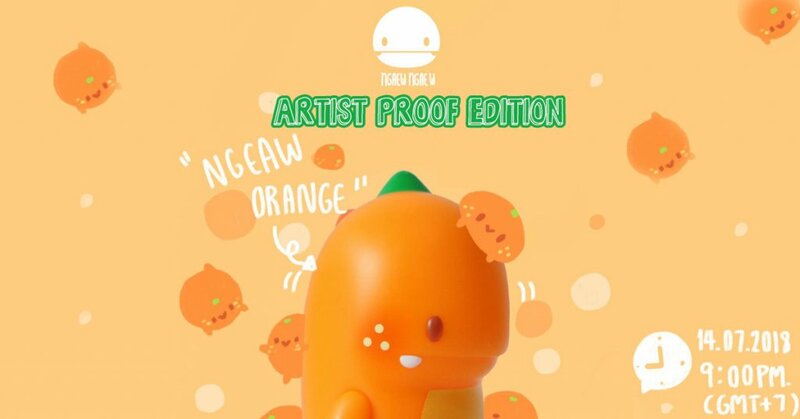 Just when you thought there would be no more second chances in owning Orange Ngaew Dino by Pang Ngaew ngaew x Unbox Industries here comes the Artist Proof Editions! From making their debut at Beijing Sofubi Festival 2018 – Summer Fruit Party and a limited number went online at Unbox that went to sell out in less than 2 minutes. Pang has given another lifeline by releasing details of her Orange Ngaew Dino AP’s! We love Artist Proof editions as we get to support the artist directly and most of the time a release has something special. In this case, Pang will include a special FREE painting A6 size. Pang will post a new picture “pre-order start!”. Comment “1” (mean 1 orange) under this post at the set time on Facebook. She will confirm order via DM and tell you how to pay. Find Ngaew Ngaew on Facebook and Instagram.